Sekandar Mokhtarzada was born in 1987. 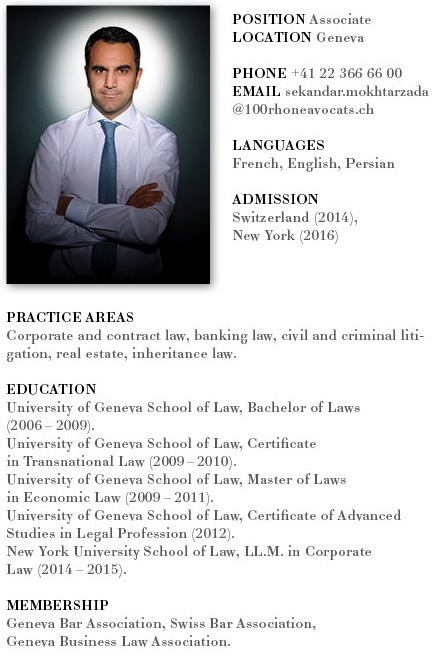 After obtaining a Bachelor of Laws at the University of Geneva, he continued his studies at the same institution where he obtained a Master of Laws in Economic Law. He worked for two years in a Geneva-based law firm as a trainee lawyer and then associate. He then graduated with a Master degree (LL.M.) in Corporate Law from the New York University School of Law and was admitted to the New York Bar. Sekandar Mokhtarzada then worked for nearly two years with a law firm specialized in business law, where he acquired an expertise in corporate law, commercial law, and contract law. He joined the law firm 100 Rue du Rhône Avocats in March 2018 as an associate. His main areas of practice include corporate and contract law, banking, commercial litigation, real estate, and international estate planning. He works in French, English, and Persian.